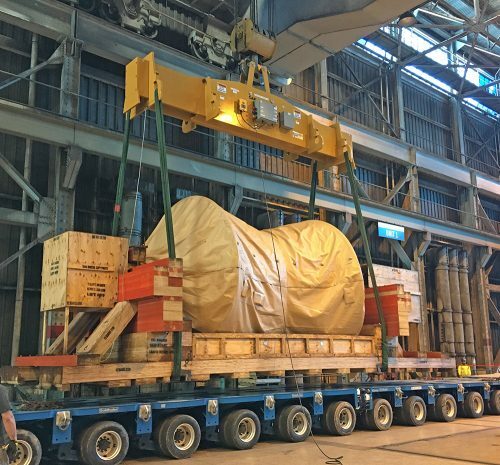 When a coal fired energy generating plant on the east coast needed to lift a replacement turbine rotor that outweighed the capacity of their overhead crane, they turned to Whiting Corporation and Whiting Services to find a way to make it happen. 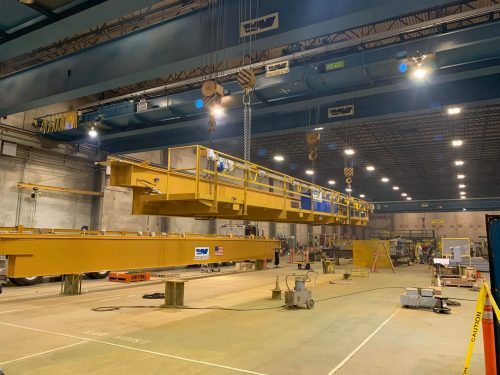 The analytical engineers at Whiting Corporation performed a detailed engineering analysis on the dual hoist trolley and bridge which included referencing the original drawings and calculations, and a complete inspection of the crane’s current condition by Whiting Services (WSI). From this analysis, a practical and cost-effective proposal was created to rerate the dual hoist trolley from 150 tons to 165 tons. The proposal called for increasing the size of the motors and brakes while modernizing the control system with flux vector hoist controls. 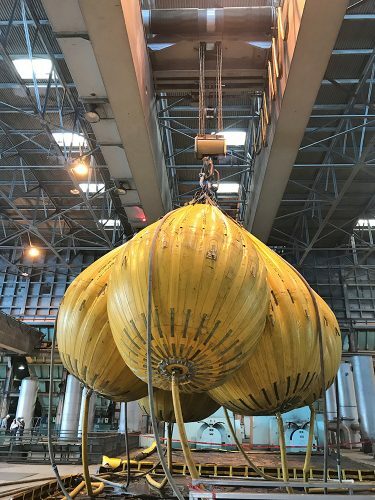 In addition, Whiting proposed new higher strength hoist gearing, reinforcing the trolley load girt plates, new hoist rope, and other ancillary materials. In turn, Whiting Services determined the necessary field work activities and was incorporated into the proposal. 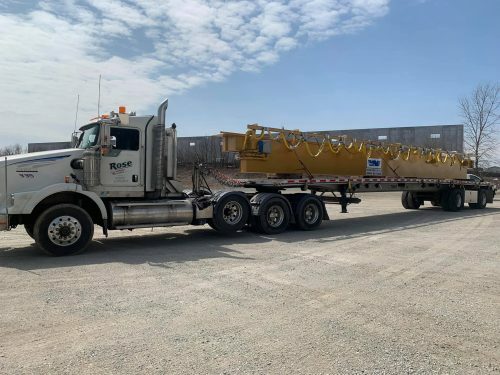 With a hard delivery date for the turbine rotor, Whiting personnel understood that all fieldwork, including start-up, commissioning, and load testing, had to be completed on time. Because Whiting Corporation and Whiting Services are able to function as a single entity with significant turnkey projects, the client had one key point of contact for questions and comments throughout the project. Communication was a crucial component of the job. Weekly status updates along with daily communications between all parties resolved potential roadblocks before they caused delays. 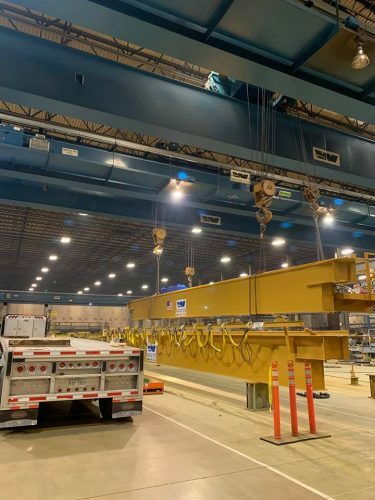 One of the complex work activities was lifting the dual hoist trolley on and off the overhead crane from outside the building. To remove the 72,000 lbs. 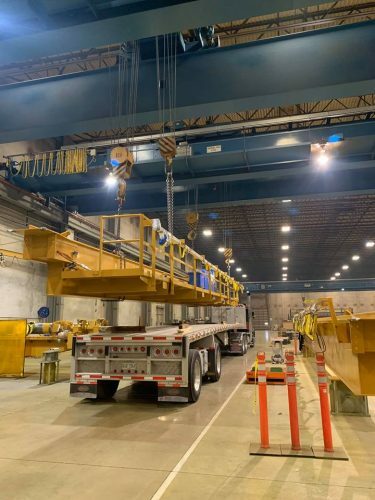 trolley in a tight lifting envelope, WSI was required to submit a detailed technical lift plan that included directing a mobile crane located outside the building with its hook passing through the building’s skylight. A Mobile Crane Lifts the Trolley Through the Skylight of the Building. One of the critical and time-consuming tasks was upgrading the higher strength ring gear installed on the hoist drum. 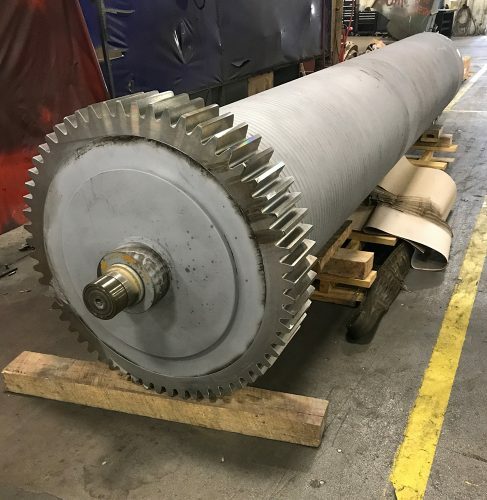 While the Whiting Services team diligently upgraded the trolley, a local machine shop was contracted to replace the ring gear. Because the project was on a tight deadline, the installation crew foreman inspected and approved the drum before it shipped to the site. With the drum back on the trolley and all major upgrade work complete, the trolley placed back onto the crane where the remaining electrical connections were made between the trolley, festoon, and controls. The installation crew performed the necessary start-up and commissioning activities. 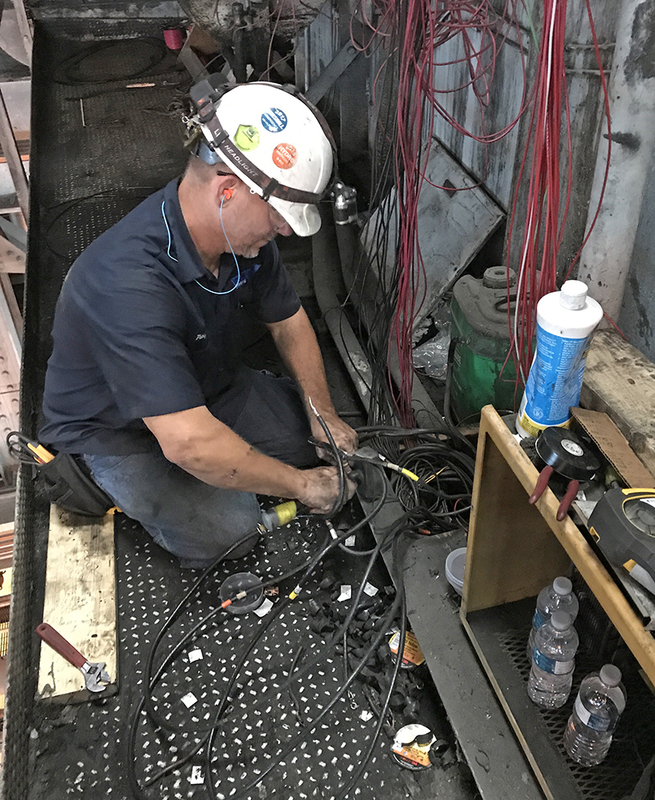 This included verifying all functions of the crane, final programming of the new motor controls, and performing the necessary adjustments to the limit switches. 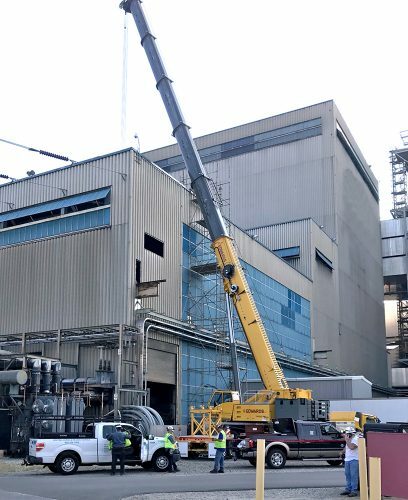 With commissioning complete, the installation team performed a load test involved raising and lowering, holding, and traversing the load at 50%, 100% and 110% of rated capacity. At every stage of the test, the trolley performed to the expectations set out by the client. A load test certificate confirmed the successful rerating of their overhead crane from 150 to 165 tons. Whiting provided a complete turnkey solution from engineering to project management, parts, installation, and testing. Open communication between Project Manager, Field Installation Team, and Client was critical to success. Whiting Services has the experience to plan and execute complex technical lifts with a high degree of safety. Worker and equipment safety was a crucial consideration at every step of project including daily safety briefings. Professional project management kept field work moving to an on-time and under budget completion. Whiting Services has the critical mass to mobilize a team to complete large jobs on tight deadlines. Most importantly, client was able to make vital lift on time. The Finished Hoist Drum with New Ring Gear Waits toBe Installed on the Trolley. The Rerated Crane is Load Tested with Water Weights. The Rerated and Modernized Crane Lifts the Turbine Rotor.